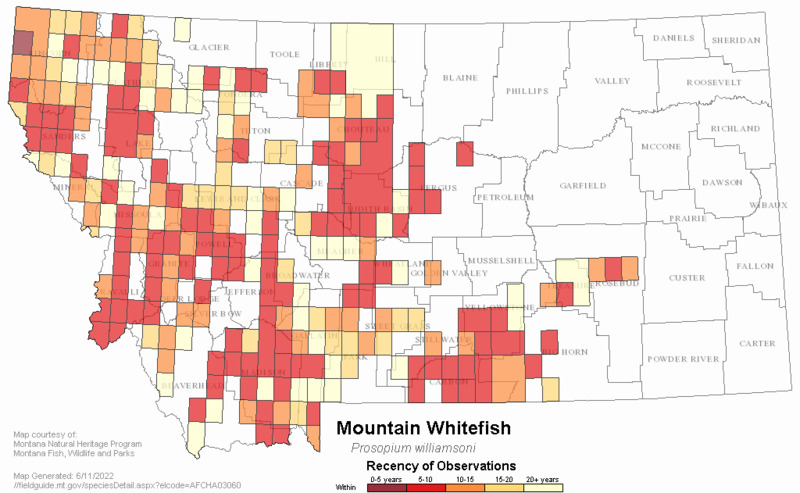 The mountain whitefish is familiar to most Montanans. This widespread native fish is primarily a stream-dwelling species, but populations are also found in reservoirs and lakes. 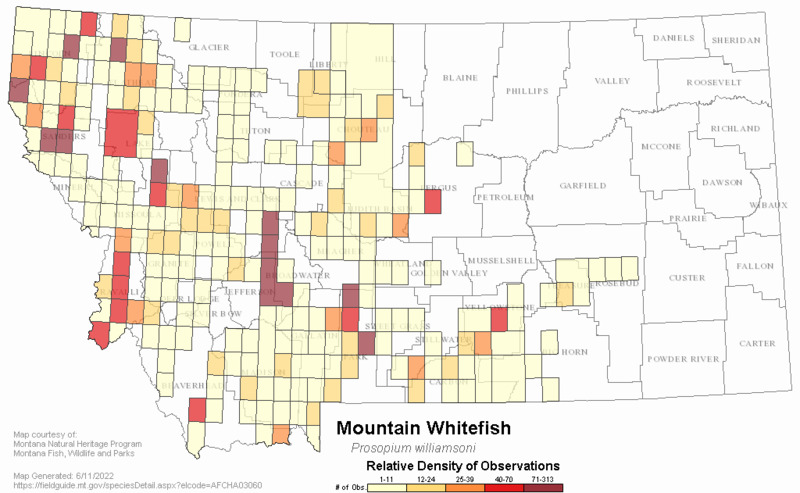 The mountain whitefish is found in abundance in most clear, cold rivers in the western drainages and eastern mountain front of Montana. The typical mountain whitefish is a cylindrical 10-16 inch fish, but they can reach a weight of 5 pounds. Trout fishermen frequently catch several whitefish for every trout taken. They are considered a nuisance by some anglers, but are sought after by others. 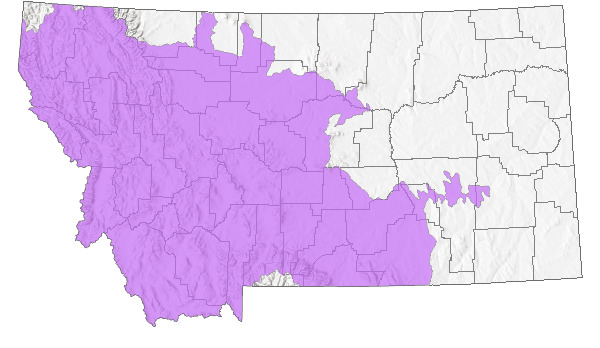 Whitefish provide forage for larger trout. They have evolved with our native trout and have been shown to provide little competition with trout. Their pointed snout and small round mouth makes them efficient at vacuuming invertebrates from the substrate while trout tend to feed more on drifting insects. Mountain whitefish often congregate in large schools on their fall-spawning runs to broadcast their adhesive eggs over gravel bars in tributary streams. Mountain whitefish are one of our most important native gamefish because of their abundance and willingness to take a bait or artificial fly. May migrate into lower reachs of tributary streams to spawn. Prefers medium to large cold mountain streams. Also found in lakes and reservoirs. Normally a stream spawner in riffles over gravel or small rubble but has been seen spawning along lake shorelines. Lives mostly on aquatic insects but also takes terrestrial insects which fall into water. May eat fish eggs, but rarely fishes Feeds actively in Winter. Zooplankton important in lakes. Competition with trout is probably slight as they use different areas in a body of water. Whitefish feed mostly from the bottom whereas most trout feed of drift out of the water column. Sexually mature in 3 years. Spawns in fall with peak during late Oct. to early Nov. at water temperatures from 35-44 degrees F. Broadcast spawner. Eggs hatch in March. 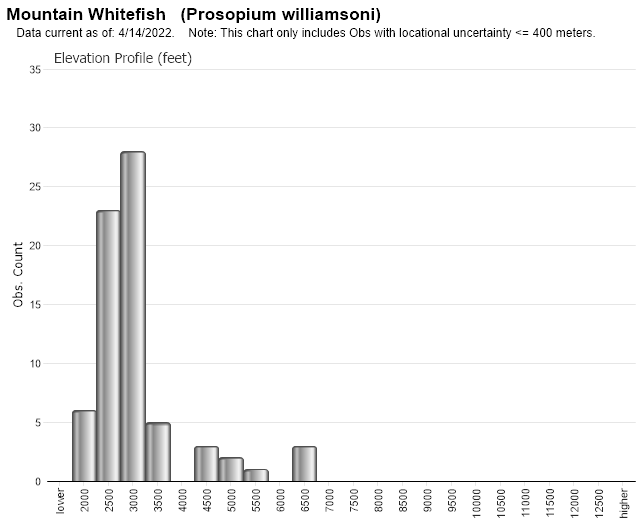 Web Search Engines for Articles on "Mountain Whitefish"